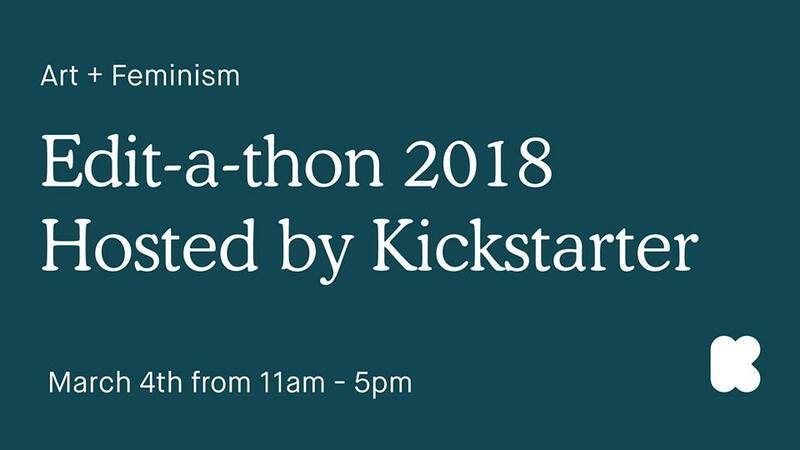 SAWCC is partnering with Kickstarter for their 2018 Art + Feminism Wikipedia Edit-a-thon— a collaborative campaign to help improve the coverage of women in the arts on Wikipedia! In a 2011 survey, the Wikimedia Foundation found that less than 10% of its contributors identify as women. This disparity represents an alarming absence of representation in an important repository of shared knowledge. Last year, Kickstarter, six partners, and neighborhood friends and family gathered at Kickstarter HQ to amplify, diversify, and grow the voices of women on Wikipedia. They hosted 35 editors and added over 20,300 words across 58 articles — 7 of which were brand new. During the event, people will then be able to pick and edit artists from any of the partners’ lists (see the end of this post for a full list of partners). Kickstarter will be providing tutorials for beginner Wikipedians throughout the day, as well as plenty of reference materials. Bring a laptop and power cord. Don’t want to be an editor? Come by to help with research, promotion, and facilitation. Light refreshments and lunch will be provided. Childcare is also available upon request (email rsvp@kickstarter.com), and we’ll have a few laptops available for use. This entry was posted in Events, Featured, Visual Art. Bookmark the permalink.